Pointe du Hoc, Normandy, 6 June 1944: The destroyer USS Satterlee observed enemy movements and swept the cliff-top with fire from all guns; nevertheless, scattered fire from flanking position caused casualties as the Rangers debarked on the heavily cratered beach. Colonel James Rudder, leading the three companies of Rangers, was one of the first ashore. Germans suddenly appeared on the cliff edge and began to harass the Rangers directly below with rifle fire and hand grenades. This threat was driven back by BAR gunners and another concentration of fire from the USS Satterlee. On June 6, 1944 one of the most audacious assaults in the annals of military history took place as the men of the 2nd Ranger Battalion landed on the shores of Hitler's Fortress Europa in the most unlikely spot - the cliffs at Ponte du Hoc. What took place was a scaling of the steep cliffs under enemy fire, storming of the enemy positions atop the promentory, and an attack inland to the D514 highway. The search was on for a German battery poised to rain steel down on the landings at Omaha Beach. What would result would be a desperate struggle to hold out against wave after wave of enemy counter-attacks, determined to push the Rangers back into the sea, an effort that very nearly succeeded. ATS Pointe du Hoc provides a sheet of new counters that include portable rope launchers, DUKW with extension ladders provided by the London Fire Department... with Lewis MGs mounted, and new ship-sized counters for the destroyers USS Barton, USS Thompson, and HMS Talybont. A new Battlefield Walkaround booklet and a set of scenarios that take you from landing, scaling the cliffs, discovering the German gun battery... through 'backs to the sea' survival of the ferocious German counter-attacks, bring it all together. 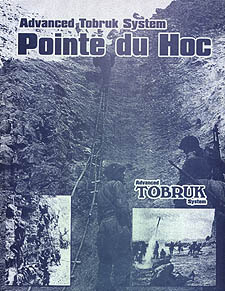 If you are ready to step into the heart of 'The Longest Day' at Pointe du Hoc... to re-live one of the most gallant assaults in the annals of military history... this is the game for you. This is not a complete game. Ownership of ATS Bloody Omaha is neccessary to play this game.